How To Open Other Users Folder in Outlook? In Outlook, we can manage another person’s Mail and Calendar Items also. There are two ways to work with another person’s Outlook Folders: One way is by Sharing Folders and the other way is to entrust someone to act on your behalf. By sharing a Folder, we let other people to access one or more Folders. This doesn’t mean though, that a person who can access your Folder that can’t reply to Email Messages or respond to meeting requests for you. For this feature to work we must have Outlook for Office 365 for business or another Exchange based Account. If you want to find out How To Open an Other User’s Folder in Outlook, just keep on reading the post below. Comments Off on How To Open Other Users Folder in Outlook? What is Conversation Clean Up in Outlook? It can reduce the number of messages in our Mail Folder. Unwanted Messages throughout a Conversation are move to the Deleted Items Folder. What is a Conversation in Outlook? Is a complete set of Email Messages from the first Message throughout all responses, where all the Messages have the same Subject. A Conversation is also known as a Email Thread. What can it do? It reduces the number of Messages in our Mail Folder. If you want to find out how to adjust the settings for the Conversation Clean Up in Microsoft Outlook 365 just continue reading the post below. 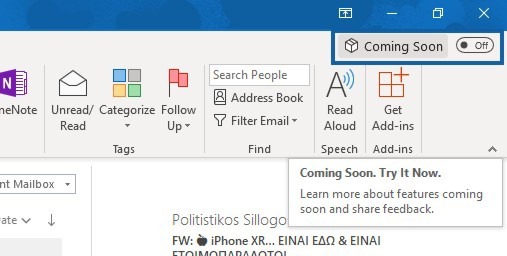 What Is The Coming Soon Feature in Outlook 365? As known Microsoft is obsessed about making things better for all us that use Outlook every day, by constantly introducing us with updates that will make our favorite email client even more adorable. This is how the new feature Coming Soon has arrived in Outlook 365. This way we have control of when we try major updates. We have a chance to try, learn about these new features before the changes are released to everyone. To learn more about the feature Coming Soon in Outlook 365 just keep reading the post below. In the image below, I have Microsoft Outlook running. We can see the Ribbon with all the available tabs and commands. In the top right corner of the ribbon below, the Minimize, Maximize and Close button, we can see the Coming Soon command. At the right of the command is the On and Off button, so we can use if we want to. What does the Coming Soon command do; We can Learn More About Features That Are Coming Soon And Share Feedback. If you want to find out more about upcoming updates and news released from Microsoft, just follow the link here. Below, you can check out the video describing the Coming Soon feature in Microsoft Outlook 365. 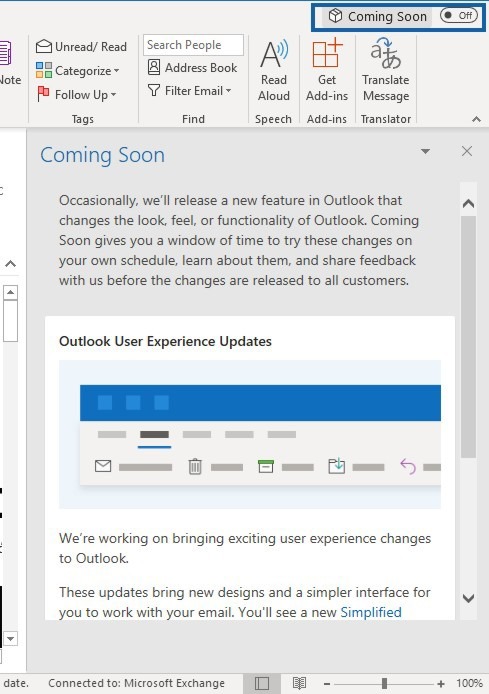 Comments Off on What Is The Coming Soon Feature in Outlook 365? In previous posts, I mentioned how to E-Mail, Share and Publish our Calendar in Outlook. It’s about time to see the Level of Permissions that we can give to anyone in order for them to Edit, Modify, Delete, etc., our Calendar. Below you can keep on reading to see How Can We Set Calendar Permissions in Outlook 365. In Outlook 365, we have a feature where we can Publish our Calendar to the Web. By this way, we send someone a link of our Calendar, showing them our free times. By using this feature, it saves us a lot of back and forth, trying to figure out a convenient time that works for the both of us. When we publish an Outlook Calendar as an Internet Calendar, urls are created that we can give to people outside our organization. The benefits of Publishing a Calendar is that we can reach a bigger audience, we can include people outside our organization, and we can let recipients only to view our Calendar and for them not to be able to add or edit events. In order to find out How To Publish Our Calendar in Outlook, just keep on reading. In a previous post of mine, I mentioned how we can E-Mail our Calendar in Outlook for us to share information with our colleagues, friends, etc. Another method that we can choose is that we can use the Share command in Outlook. Sharing a Calendar is more controlling, because it allows us to invite people within our organization to see our Calendar. When we share a Calendar, we can also specify how much detail the recipients can see or modify. just continue reading in order to find out how to Share A Calendar in Outlook. Many times, we find ourselves wanting to Share Calendar information with other people, colleagues, etc, in Outlook. Which way is the best and easiest method to accomplish it? We can actually E-mail our Calendar in Outlook. To find out how, just continue reading.